Regain your smile’s naturally beautiful aesthetics with a dental bridge, available at Hart Dental. If you have a missing tooth, you’ve probably wondered what you would look like with a replacement. 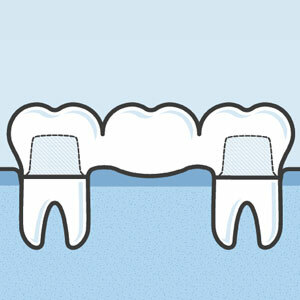 A dental bridge is appropriate for a single tooth or multiple teeth that are missing. Dental implants are a modern solution to replace teeth but aren’t suitable for certain situations. In these cases, a bridge may be a cost-effective alternative. Over the course of two appointments, you can be fitted for a bridge that is color-matched to your existing teeth. Once we’ve determined that a dental bridge is the best solution for you, we’ll take impressions that are sent to our laboratory, giving you a temporary bridge to wear in the meantime. The bridge will be sent back to our clinic in two weeks. The teeth on either side of the gap are prepared, with decay or unsupported tooth structure being removed and replaced with fillings. The bridge involves 3-4 dental crowns with a fake tooth or teeth suspended in the middle of it. With the surrounding teeth prepared, your dental bridge will fit seamlessly into the gap. Nitrous oxide is always available to you, ensuring your comfort each step of the way. Most people are candidates for dental bridges. We do not recommend them in cases where the surrounding teeth are healthy and free from restorations, as some of the tooth structure would be removed. It’s important to understand that a dental bridge requires maintenance. It has to be cleaned from all sides. Additionally, it can lead to a slightly black-colored triangle if it’s placed in the front of the mouth. At that time, however, we can replace it with a new bridge or a dental implant. Many insurances cover dental bridges and have a missing tooth clause. We’ll preauthorize your bridge with your insurance company to make sure that we maximize your coverage. If you don’t have dental insurance, we’ll be happy to arrange a payment plan with you. Contact Hart Dental today to arrange your appointment! We offer late opening hours and convenient Saturday visits.